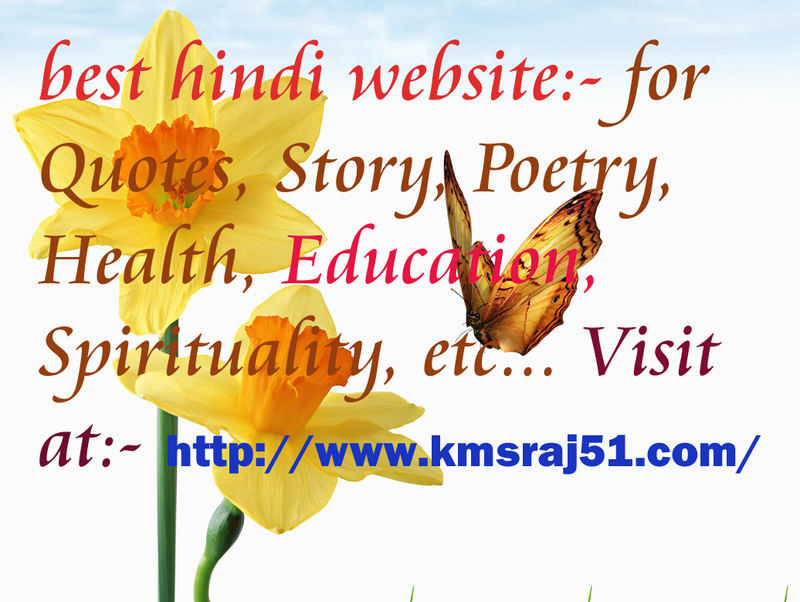 You are here: Home / Archives for kmsraj51 की कलम से ….. Filed Under: 2015 में इन 6 तरीकों से दिल और दिमाग को देंं नया जीवन।, 2015-Kmsraj51 की कलम से….. 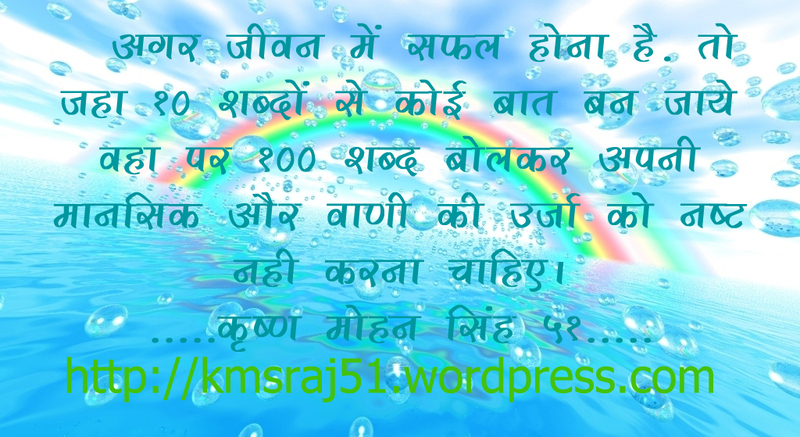 Tagged With: Brahmakumaris Motivational Thoughts-Quotes, http://kmsraj51.com/, Inspirational Thoughts in Hindi, Kmsraj51, kmsraj51 की कलम से ....., Quotes in Hindi !! You will notice many people in your life who are very much in need of love but they attract the opposite energy. This is because the negative energy of lack of love for the self and low self esteem which they continuously radiate causes them to attract that same negative energy from others. In the same way, there are many people who are very much in need of success but they attract failure repeatedly. Failure is directly related to the quality of energy we radiate i.e. how positive and powerful our expectations of success are. Once we set the goals that we wish to reach, we need to be careful that we move towards our aim without creating the negative energy of fear inside our consciousness. Failure appears when we make an effort to achieve those goals and we damage the result or attract failure without us desiring so, simply because of our fears of failure.Even then, if at that step we feel that we have failed, we need to have a positive and constructive attitude. We need to emerge the power to face and power of acceptance inside us. That way our creative energies will flow and we will carry on going forward without the failure (whether real or only perceived by us to be real but actually not real) becoming an obstacle in our path from doing so. Although at that time it may seem as though we have missed an opportunity or that some openings have closed for us, have faith and be fearless. If we are fearless and radiate positive and powerful energy, other possibilities will open up. We have this deep rooted belief that our fear will keep us safe, and we treat it like a comfort zone, a red signal that tells us that we should stop. Creating a time every day to do something that you fear, helps you to re-condition yourself internally to begin to see the fear as a green signal and to develop inner courage, so that you can move towards your goal of success. Each day, do what you fear and the fear will soon be removed. Expression: Happiness lies in understanding the secret of whatever is happening. When one is able ot remain happy in this way, he is able to spread this happiness to those around too, influencing the lives of all. Experience: When I am able to remain happy under all circumstances, I am able to be free from the influence of others’ negativity. Instead I will be able to become a major source of positive influence to those around me. • Where is the soul before it comes into a physical body? • Where does the soul go after it leaves it? • What is the purpose of the world drama? These are questions that deeply concern human beings, yet until now there isn’t 100% conclusive proof of life after death. The images of “fires of hell” and a heavenly world beyond the clouds are talked about in the world’s religions. Yet to the rational and logical minded, the states of living forever tortured in holes of fire (hell) or on the other hand relaxing in complete happiness in a fairy-tale kingdom (heaven), seem far away from the reality of the present. Most accept that there is some order to the world creation, but viewing our drama through spectacles of body-consciousness it is impossible to see it, as the soul is imprisoned by bodily needs and sensual desires. In body-consciousness the soul is unable to see anything clearly. Only when we are at the point of death does one think about life after death. At funerals, everyone faces the new absence of a loved person, the departure of the personality and the temporary nature of the physical body. Everyone wishes that the person who has died will go to heaven and not to hell. To be successful I need to have the balance between the head and the heart. Projection: In my interactions with others, I sometimes only use my head, i.e., my logic. I am very logical and understand the facts very clearly. But if I keep myself limited only to the facts, I tend to forget to use my heart. I then am not available to the other person and fail to understand him. Solution: In order to be successful in my interactions with others I need to have the right balance between my head and my heart. I need to see beyond what the facts say and try to listen and understand the other person too. When I do this I will not hurt people with my attitude but will be able to maintain harmonious relationships. We subconsciously know that we are souls. Birth, life and death are just stages in existence. In fact all natural processes can be found to have a beginning, a middle, an end and a new beginning to continue the cycle. The soul takes a bodily form, gives life to it and after a period of time, long or short, leaves it and takes another suited to the continuation of its role. As long as the soul is in the body, the body grows like a plant from baby to child, youth to maturity. It then begins to decay and finally becomes unusable. The moment the soul leaves the body, the body becomes like a dead log of a tree. It immediately starts to decompose and eventually goes back to dust. Again the soul moves into a foetus inside the womb of a mother. After time it emerges as a newborn baby and immediately begins to show the sanskars it had developed in its previous life. It is the same soul but in a new physical situation. Thus death is merely the means by which a complete change of circumstances and environment for the soul takes place. Time never kills the soul, but the body, being a part of nature or matter, obeys the law of decay that everything new becomes old and eventually finishes. The molecular components of this body disintegrate only to re-integrate as another form (body) some time later. The process of birth-life-death-rebirth is also eternal (without a beginning or an end). It has always been going on and will continue. The soul comes into the body, expresses a role and experiences the results of that for a certain time, then leaves it, and the process starts again. Similarly, souls come into this world, remain here as actors for a number of births and then return to the region from which they come, for rest. This process also starts again. The pattern is a cyclic one. This is called the eternal world cycle. To make thoughts as pure as the actions is to be truly elevated. Projection: There is usually attention on the self not to perform any negative acts. There is also considerable attention not to speak any words that are harmful or negative. But very rarely is there that attention on the thoughts. Because of this a lot of negative thoughts tend to remain in the intellect causing trouble for me. Solution: I need to understand the fact that my thoughts form the basis for my words and actions. The more I pay attention to make my thoughts positive, the more it will make a positive impact on my words and actions too. Constant awareness of a positive thought enables me to maintain my own inner positivity. The power of influence in relationships is extraordinary, but it practically disappears when we try to exercise control and force. • communicating in the right way. In negative control we generate stress, frustration and anger. In positive influence the energy flows in a relaxed way with harmony and is not threatening, respecting each one for their specialty and allowing each one to be as they are. In order to influence positively we need the power of discrimination and judgement in relation to what to say and what to do e.g. when you believe that the other person is the problem; generally the problem is not what others say or do, but rather how you perceive them. The way that you judge is what creates your negative feelings about them. We have the choice to perceive others as a threat, as a problem, or as an opportunity; an opportunity for learning, for change, for dialogue and understanding. We can choose to have compassion (kindness); to feel that the other is a problem indicates a lack of compassion. The way to control the mind is to talk to it with love. Projection: Whenever I find my mind wandering I try to control it with force. I try to pull the mind and order it not to think about something. Yet I find that, the more I try to force the mind not to go in a particular direction, the more it tends to go there. Solution: The only way to control the mind is to talk to it with love. Just as I would explain to a child, I need to explain to it with love. This will make my mind my friend and I will be able to concentrate even in any undesirable situations. Standing Back : We can do this individually or as a team, when stressful situations occur. We may take a few minutes to stand back mentally and physically from the situation or scene. Observing : The next step is to re-view the situation, as if we are an onlooker or a detached observer. Being as silent as possible, we can ask ourselves if the thoughts we are having are the ones we wish to keep, if they are going where we would choose them to. Steering : In the resulting silence, it is possible to steer (change direction) our thinking to where we want it to be; perhaps to personal affirmations (positive thoughts) we use to calm us. 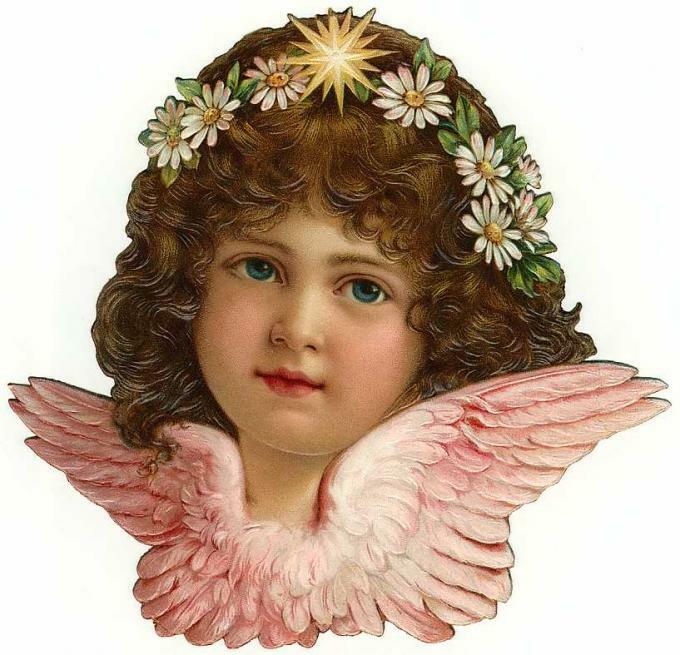 The affirmations can be: ‘I am aware of myself as calm and peaceful or, ….as happy and satisfied’, etc. This technique changes our attitudes and feelings, which influences positively the situation as well as how others respond. To have a clear aim of where the action will lead is to be successful in everything. Expression: Many a times it so happens that one acts immediately seeing a situation. But the one who is successful analyses the situation and predicts the outcome of the action that he performs and then acts keeping the end result in mind. Because of knowing the consequences of the actions before actually performing that action, he is able to continue putting in effort in spite of the challenges and difficulties. So he continues to give his best to the task. A very important aspect of progress in the self and my relationships, which we all desire is restoring a sense of responsibility in my inner world, so that by doing that, I and others around me are benefitted. Even on a physical or non-spiritual level, someone who is responsible while playing his/her role or performing his/her duties either in the family, at the workplace or in some other setting e.g. a club group or a team in a particular sport or a social service group, not only feels content with his/her actions himself/herself but spreads ripples of contentment to others and receives similar energy from each one he/she is involved with. In the same way on an emotional or spiritual level, when I start my day I need to remind myself of my responsibility towards myself.I need to remind myself that I am responsible for the choices I make in my life which influence and color everyone around me. So do my thoughts, feelings, the way my personality functions internally and externally the whole day and my responses to people and situations, for all of which I am responsible. It is like taking a pledge of responsibility with the self in the morning that today I will not create a single thought, word or action which is against the texture of my innate, positive nature i.e. irresponsible. And what will provide my pledge the much required strength of determination? An injection of positive thoughts, emotions and sanskaras within me in the morning, using a suitable technique of self empowerment like meditation or spiritual study or some other. By taking such a pledge of responsibility and by watering it with the energy of my attention from time to time during the day, I am able to implement it and can make a difference to not only the people around me, but to a lot more than that. In this way, as I change, the world around me changes, because the energy I create in my inner world starts flowing into my circumstances, my interactions, my sphere of karmas, etc. to make them positive, which benefits me in return in the form of a cyclic process. As I take this pledge and abide by it for a few days, I start realizing the immense potential that it possesses. To transform waste into something purposeful and powerful is to remain light. Expression: To successfully transform something waste into something powerful and meaningful is to look beyond the situation and see what it has to teach. When there is the ability to do this, there is the ability to go on in spite of the most challenging obstacles. There is the deep understanding that nothing happens without a purpose. There is no time or energy wasted in wasteful company. Experience: When I understand the significance of everything that happens, I am able to transform in a second. So I am able to remain light because I am able to put in sincere effort and free myself from the burden of waste. I also find that there is no problem in my relationships too, as I am able to understand others and behave accordingly. 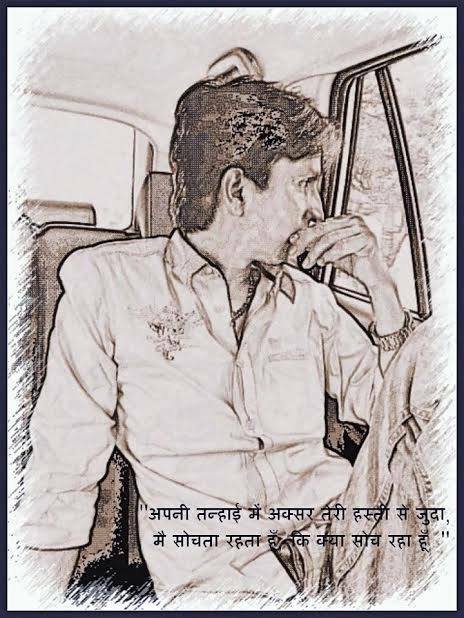 यदि आपके पास Hindi या English में कोई article, inspirational story, Poetry याजानकारी है जो आप हमारे साथ share करना चाहते हैं तो कृपया उसे अपनी फोटो के साथ E-mail करें. हमारी Id है::- kmsraj51@yahoo.in . पसंद आने पर हम उसे आपके नाम और फोटो के साथ यहाँ PUBLISH करेंगे. Thanks! !